Next in the series of homes I previously designed in 2016 but never had time to share with you is Niki’s Art Studio. 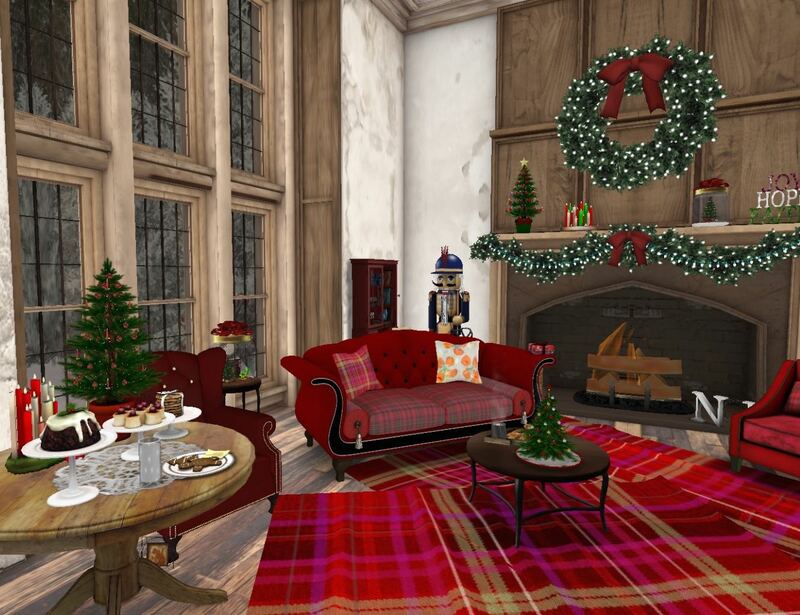 As you know, Niki is my former design/business partner and sim owner. 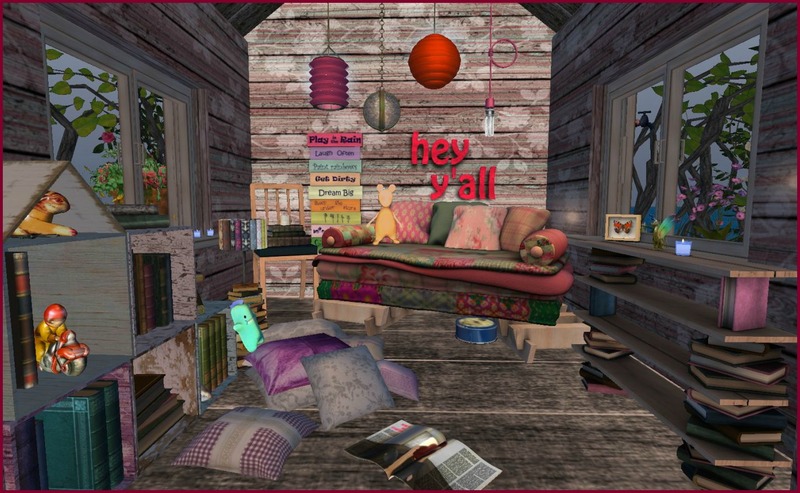 She is an artist (painter & photographer) in her first life and has always wanted her own studio in Second Life. 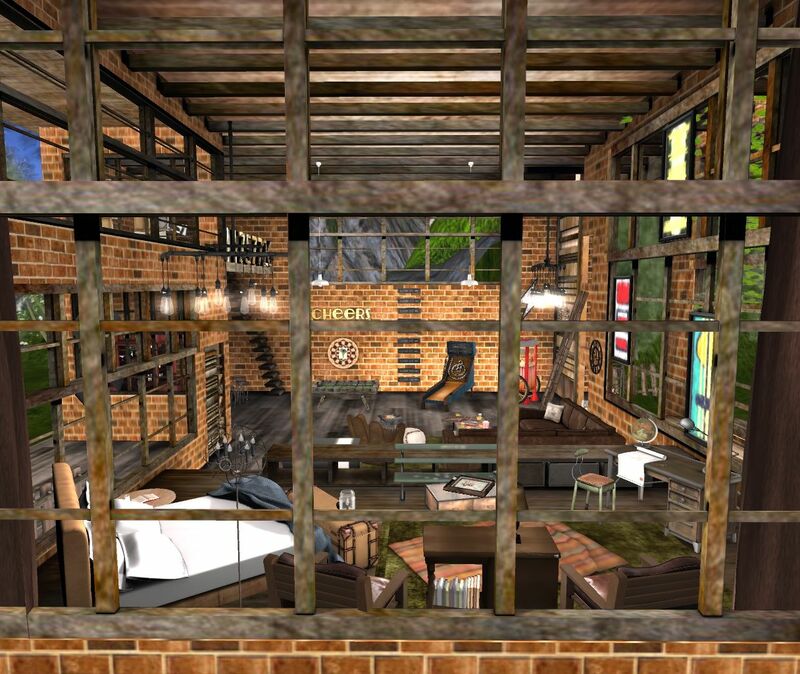 I found this awesome shed by Hideki and Niki designed an eclectic industrial warehouse space with a lounge area displaying photography and sketches in the front room. And in the back is Niki’s disheveled workspace with multiple ‘works in progress,’ spilt paint cans, neon signs, ladders and great natural light. 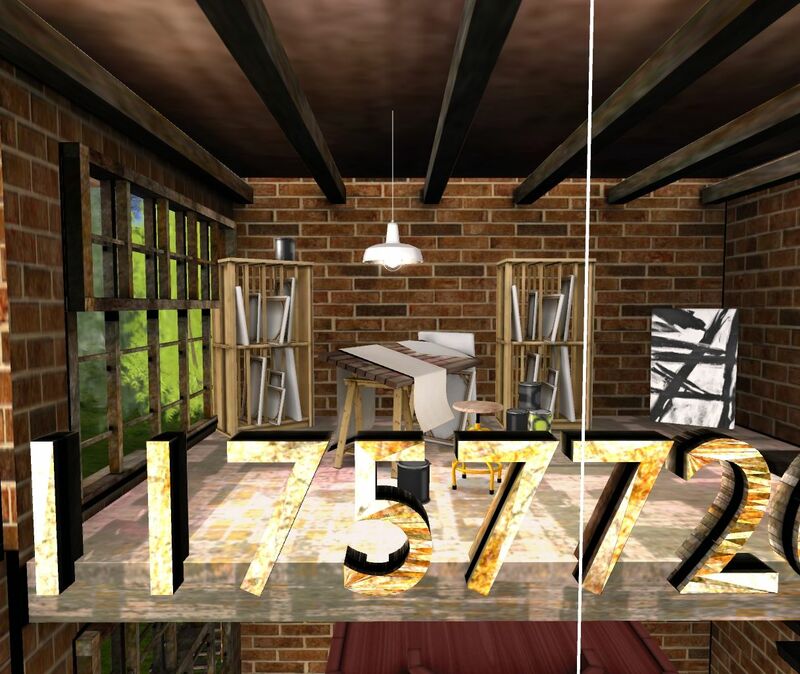 Niki’s studio has a funky creative vibe perfect for the artist-in-residence. Once again, big shout out thank you goes to Kirra Frantic who took time to capture our designs. If you have any questions or comments, please feel free to post below, connect with me on social media or email: gloriasilverstonesl@gmail.com. 10, 9, 8, 7, 6…. Happy New Year! Yay, I can’t wait till the hand strikes midnight. I’ll be so happy for a new year to usher in and explore new opportunities. I’ve always loved ending the year by reflecting on the old year in review. It encapsulates milestones we forgot, people who passed on and world events that shape our future. 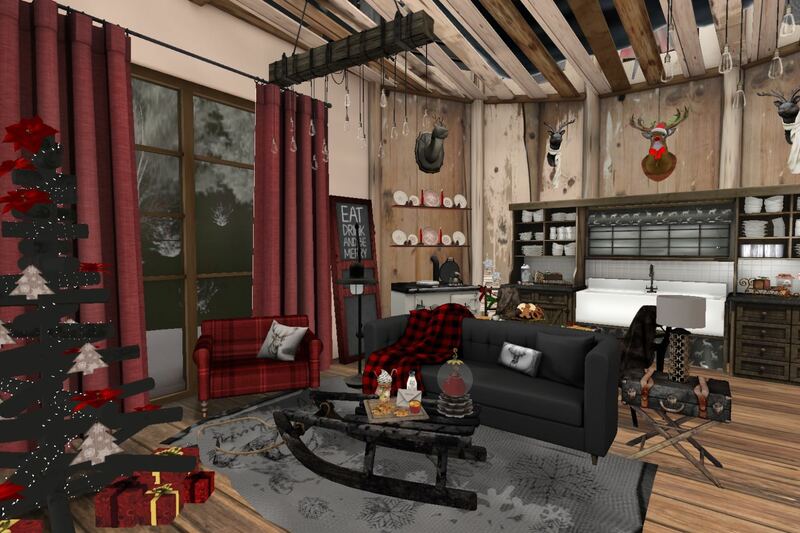 In 2014, I expanded Hidden Gems in Second Life to include the world of interior design, blending my love for style, fashion and art. This year, I added personal stories and references to my great home state of California, showcasing the diverse architectural styles. 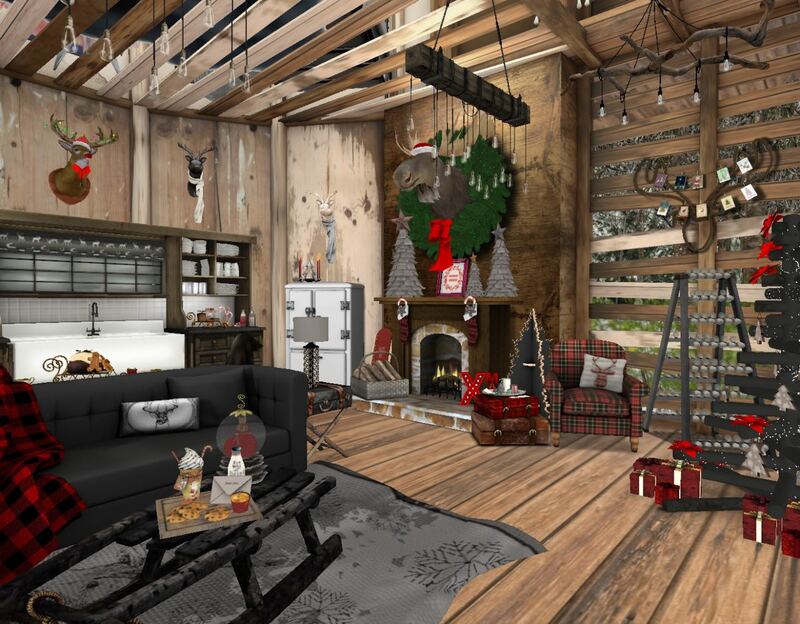 I brought you a variety of interiors from farmhouse to retro, shabby to Victorian, nautical to Alpine, and almost every Christmas decor. In addition, I’ve offered you Western, Renaissance, Moroccan, 20s, log cabin, houseboat living and space travel. We camped with the gypsies, played with the fairies, and ate every sweet treat in town. 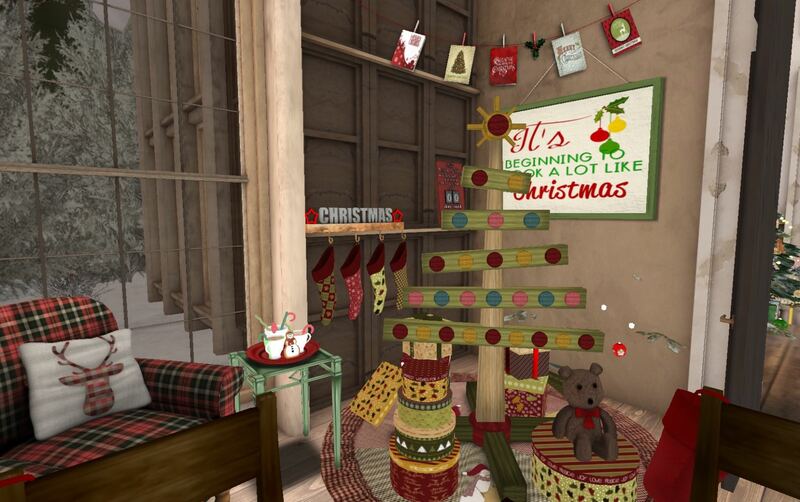 We went back in time to Annie’s dress boutique complete with a tailor’s room and community park. We dirtied our hands in the good earth to grow flowers and veggies, and rested to enjoy our accomplishments. We celebrated every American holiday from Valentine Day, to Easter, to 4th of July, to Halloween, to Thanksgiving. We even had a wedding anniversary! Our passport books were filled with stamps from across the globe and memories were made. I hope you enjoyed our journey and look forward to more! To summarize 2014, Niki Silverweb (design partner & blog contributor) and I selected our top 10 blog posts. Let me know if your favorite missing! 1). Delicious Delights & Shop ’till you Drop! 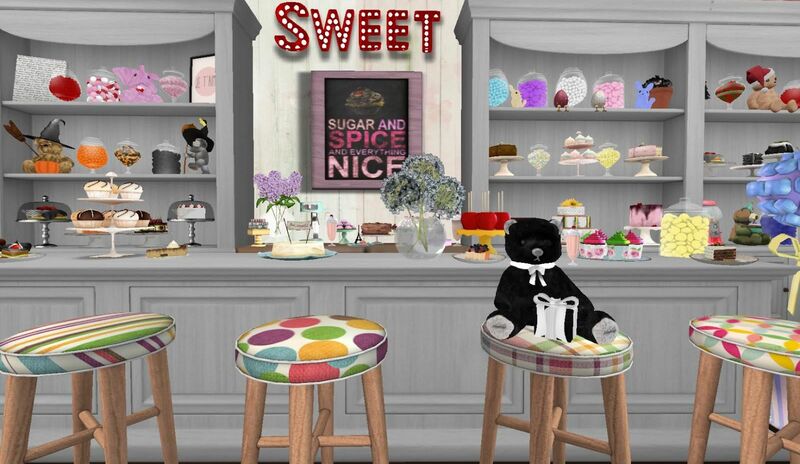 Delicious Delights: The sweet shop is incredible. You paired cakes, cookies, and teddy bears for each and every holiday. 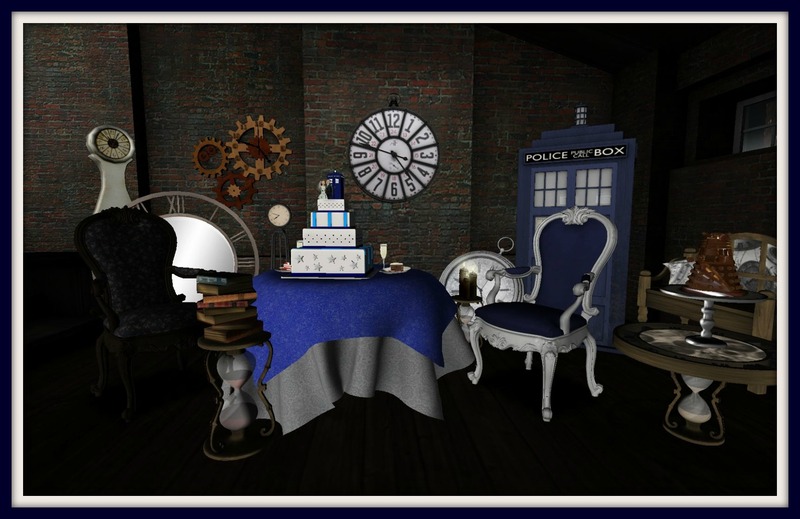 I loved Dr. Who and adored the baby’s first birthday circus cake; what child of any age wouldn’t be thrill by walking into the sweet shop! 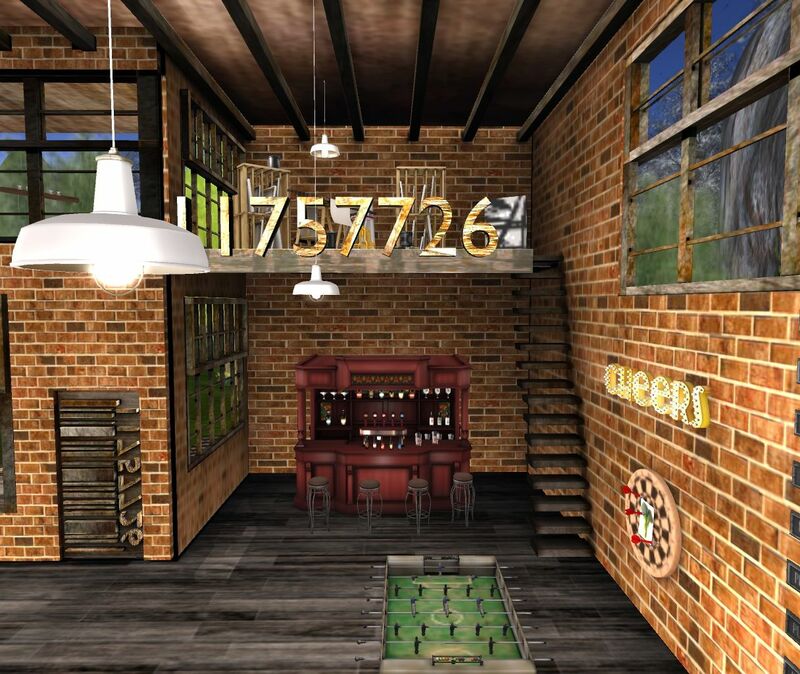 It is a perfect place to meet & greet your friends for a soda, or beau for a sundae. The gazebo outside with ocean views was just the icing on the cake! Shop ’till you Drop: Glory wow, wow, wow and triple Wow! You knocked me out on this design. You stole my shoes and handbags, but you put them together so beautifully, I can’t be anything but in awe of your talent. What I love about this build is the incredible attention to detail and refinement including your signage, merchandising, and styling. You paired so many disparate designers and made them work together in a unique fashion seamlessly. Please give me back my butterfly shoes! 2). 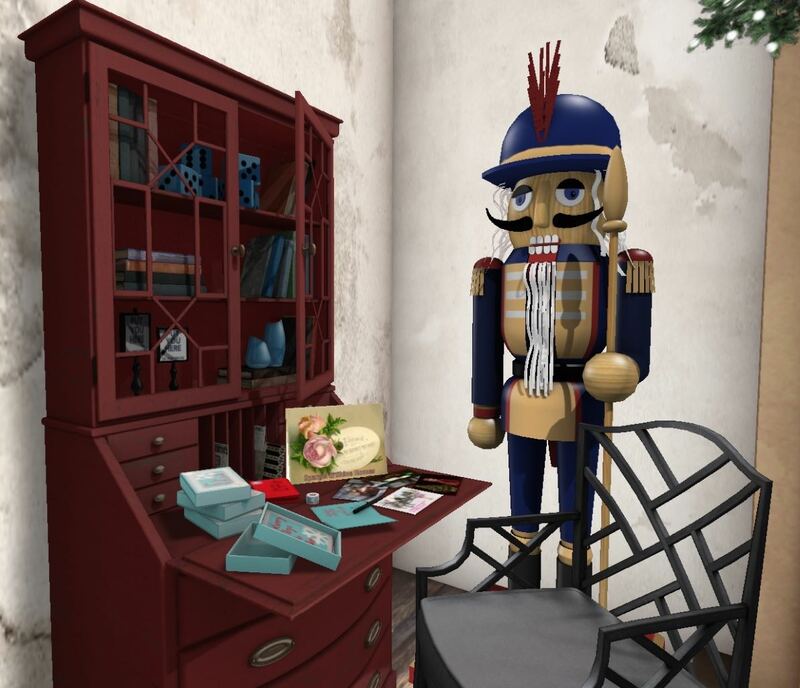 Holiday Open House Tour! 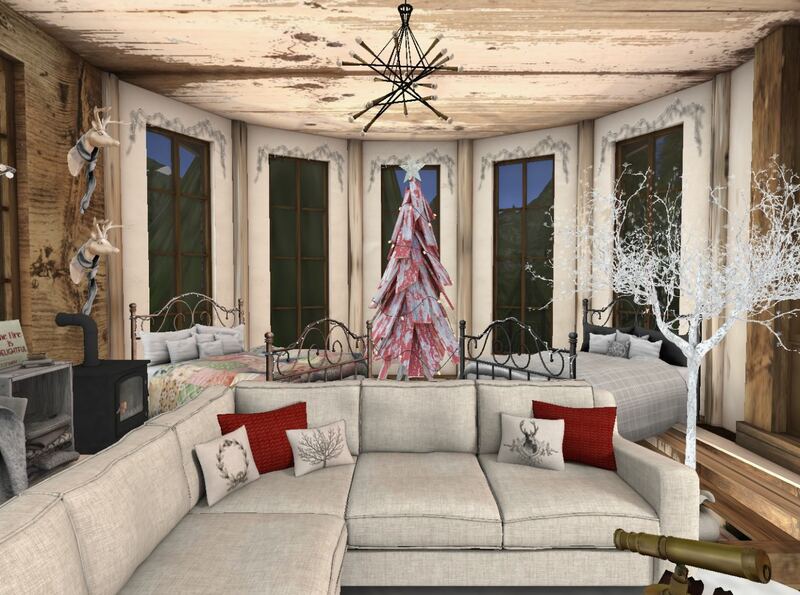 By far & away I loved our last design the best, our Holiday homes. 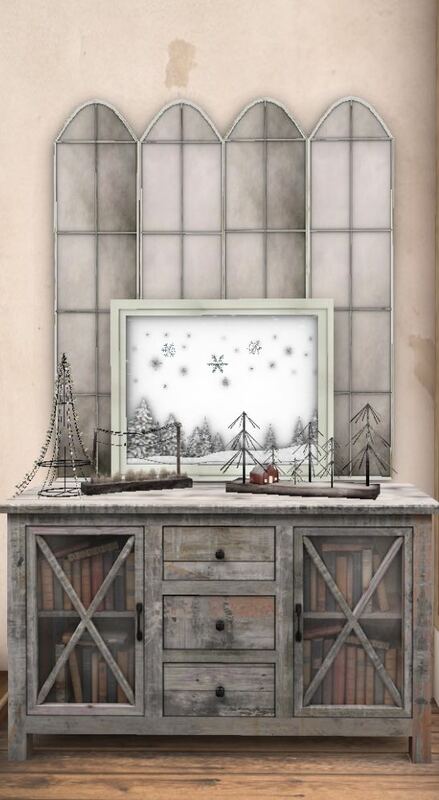 It embodies everything I love in design: warmth, charm, and cheer. 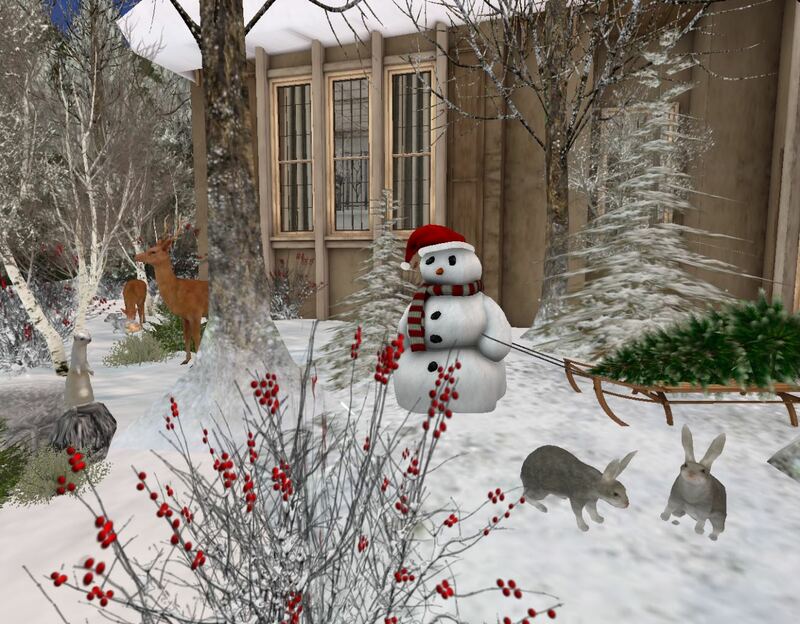 As you land in the snow laden spot, Sassy, head sheep and her crew, the bunnies and the penguins are there to greet you. Dotting the front area is a skating pond and a gazebo for relaxing. Walk through the double doors into our elegant entry hall and a feast for your eyes begins. 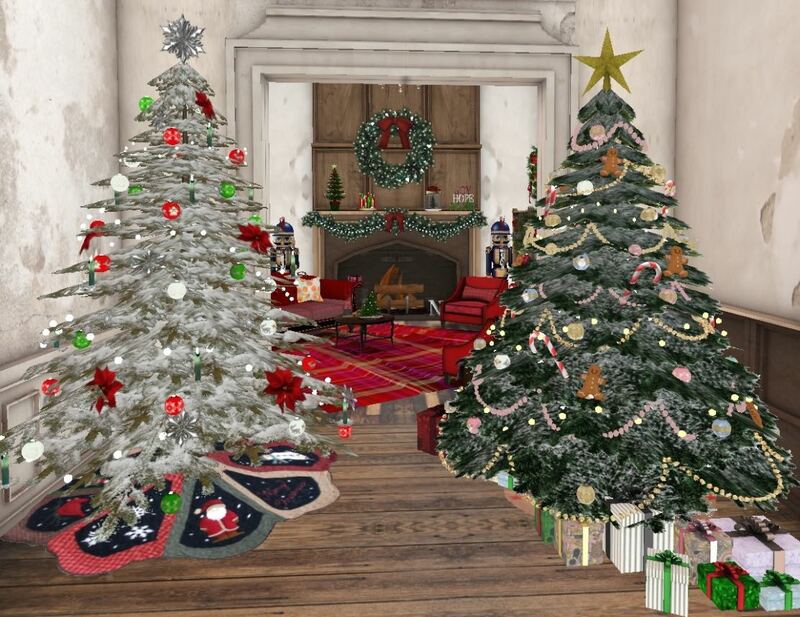 Continue forward into our ‘Hall of Trees.’ Glory appointed the room with gorgeous trees from all the best designers in SL; it reminds me of a charity event we had a few years ago called the Festival of Trees. 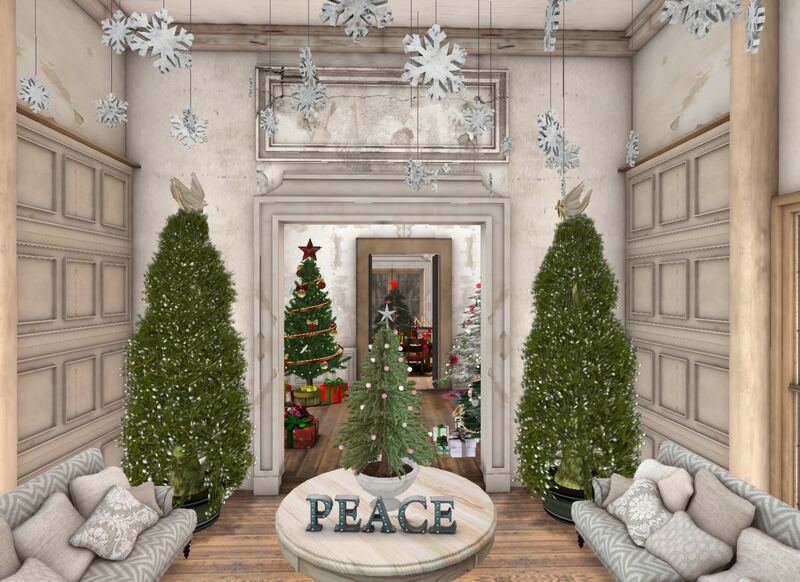 Every design house and store created individual trees for auction and raffles. It was a fantastic event! Every imaginable tree was created from a tea-cup tree, to a stick tree, to a black tree. I think Gloria recreated this in our beautiful home. Turn to the right and it will lead you to the great room, elegant, yet down home charming. 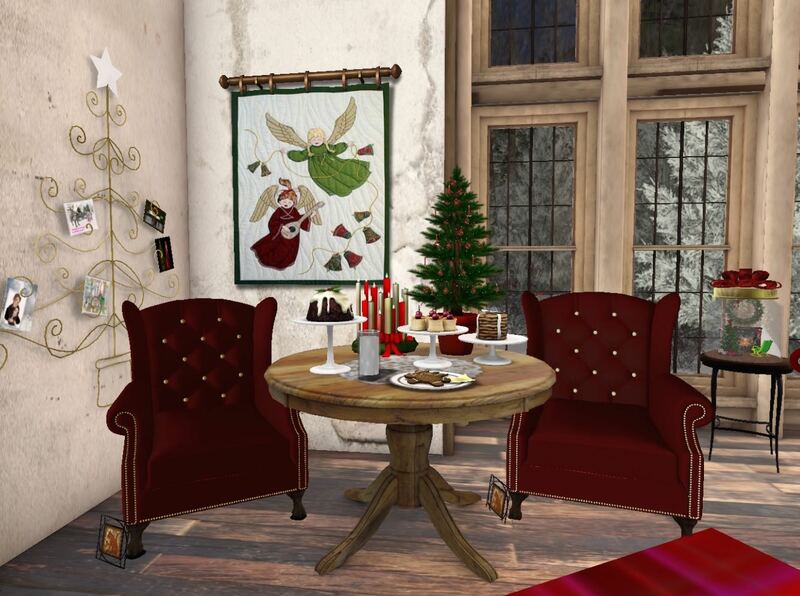 Grab a cup a hot cocoa, or malt cider, sit back and chat with friends. Soon you will be called to dinner, the room just behind the Hall of Trees. Oh what fun is this! 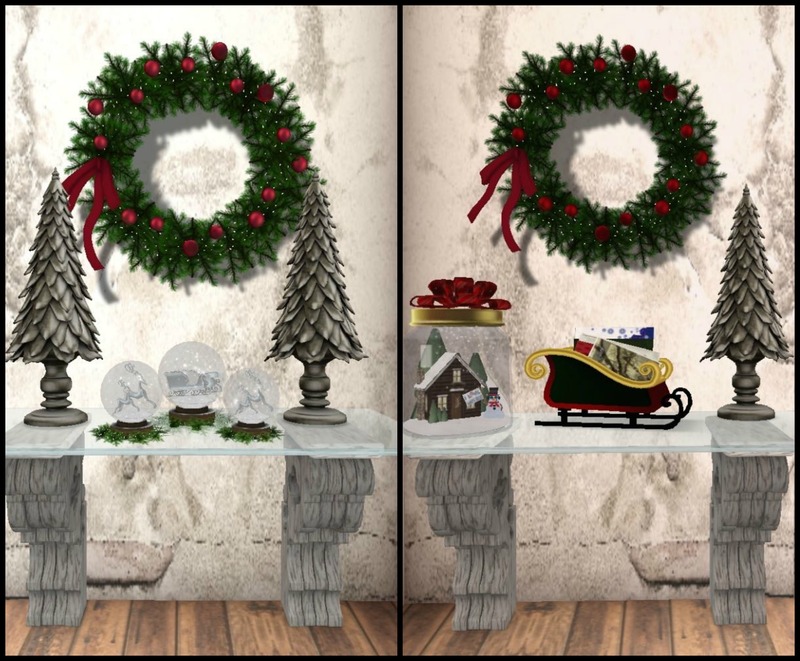 A mini choo-choo train with puffy smoke under a St. Lucia tree complete with red candles is the focal point of the room. 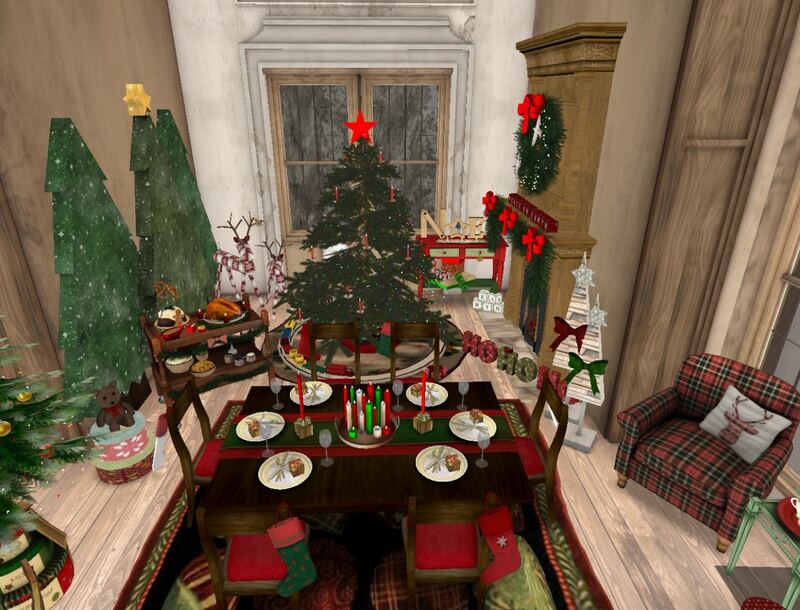 There is a children’s table and a grown-up table, stockings and presents for all! Laughter and cheer fill the halls, the kids are giggling, and the aroma of great food wafts through the dining room. You have to take a peek into my master bedroom. 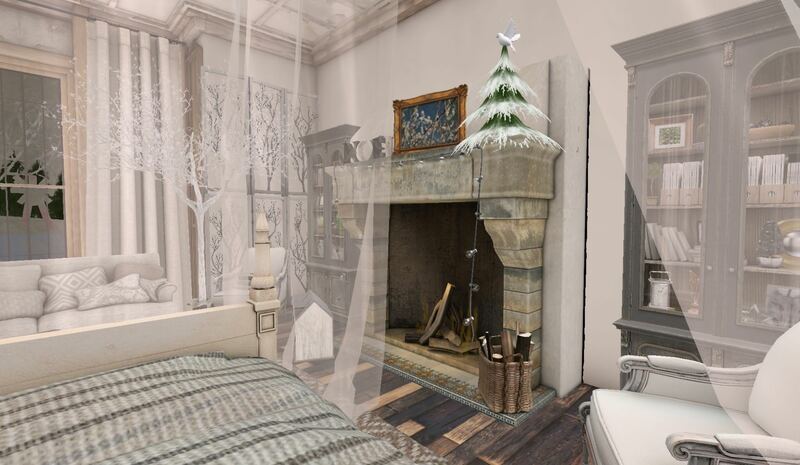 It exudes my style, white on white, cashmere and linen, huge crackling fireplace and my favorite friends, Gloria’s kitty Snowflake and my new kitten Twinkle. Also present is Miss Snow Angel and Romeo (our adorable Teddies). Detail, detail, detail. 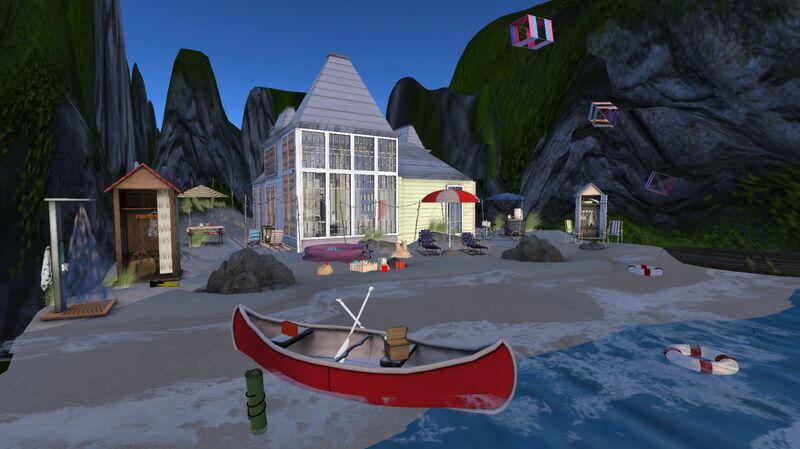 At first all you see is a beach house; surfing (yay! ), sunning (yay! ), and BBQ-ing (yay!). Enter and we have all the luxuries of home, including a glorious dining table, family room, and spectacular living room. I loved sleeping in the bedroom with the fresh crisp linens and woolen blankets, with reminders of salty sea captains and knot ties on the wall hangings. It was so comfortable and warm on a cool summer evening. Enchanting with romantic nods to Jane Austen, Emma and English gardens. 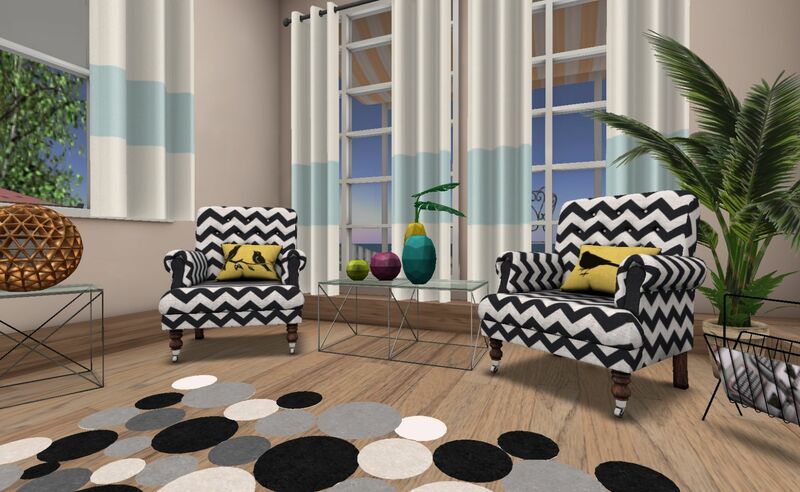 There are so many more fab interiors designs Gloria has created this year. What I really appreciate about this designer is the depth and scope of Glory’s design ability and her fearless approach. 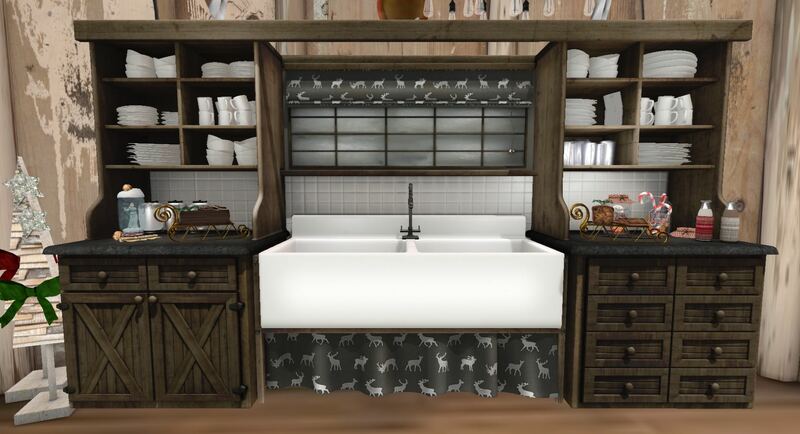 Gloria has done every style from shabby to chic, modern to Victorian, funky to down home, elegant to rustic. Gloria has tackled all styles and made them her own. 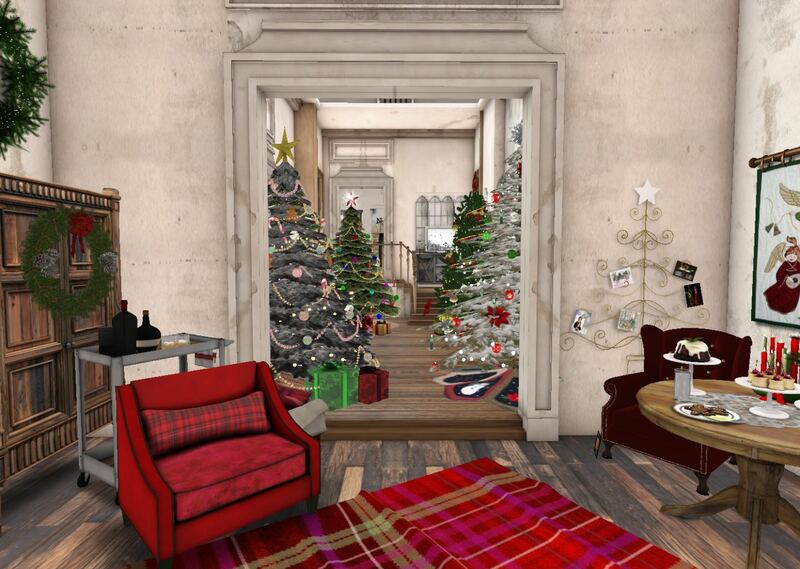 I so admire this designer, I think she’s by far and away the best interior designer in Second Life! 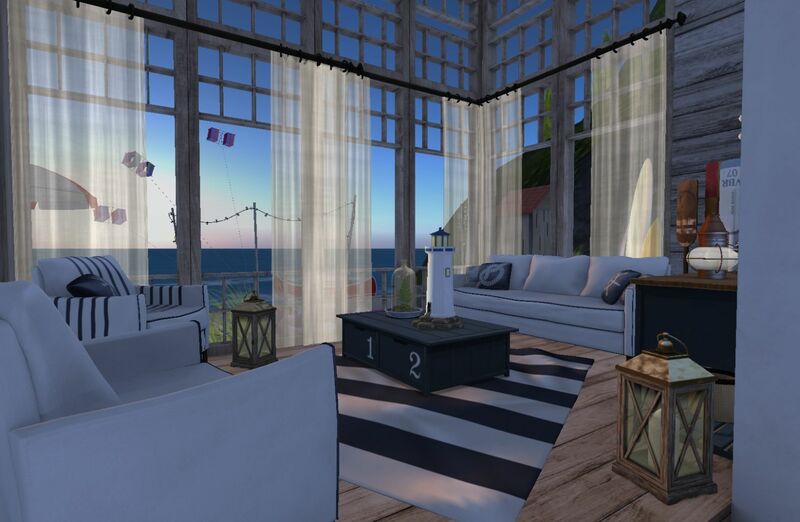 The nautical build was my first open house, first sim build, and first time the entire house was designed based on a theme with a color palette of navy and white with touches of red. I was nervous to host an open house, convinced no one would show up and people wouldn’t like it. Wow, was I wrong. 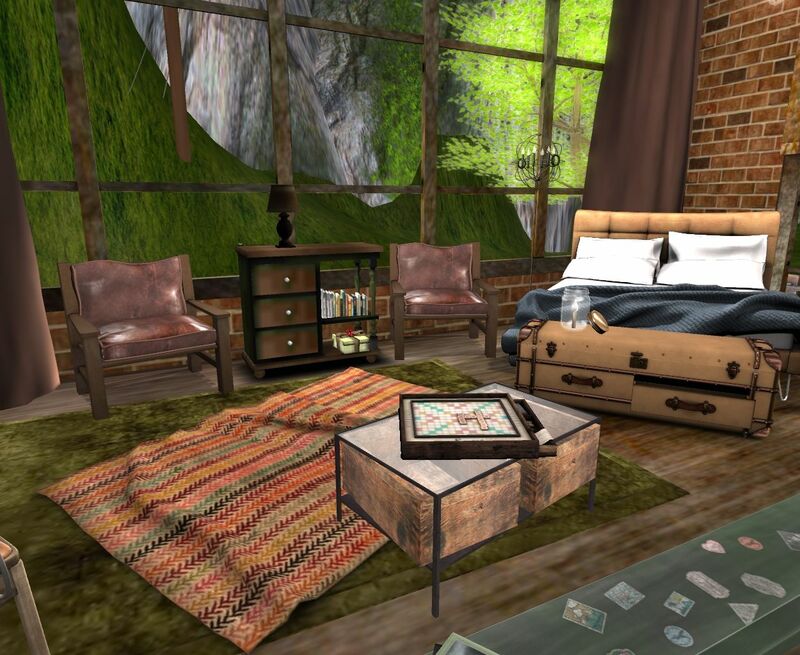 I received the greatest feedback from friends, fellow interior designers, bloggers, designers and strangers that found me along their journey in SL. It prompted me to host five other open houses and in 2015 look for more! 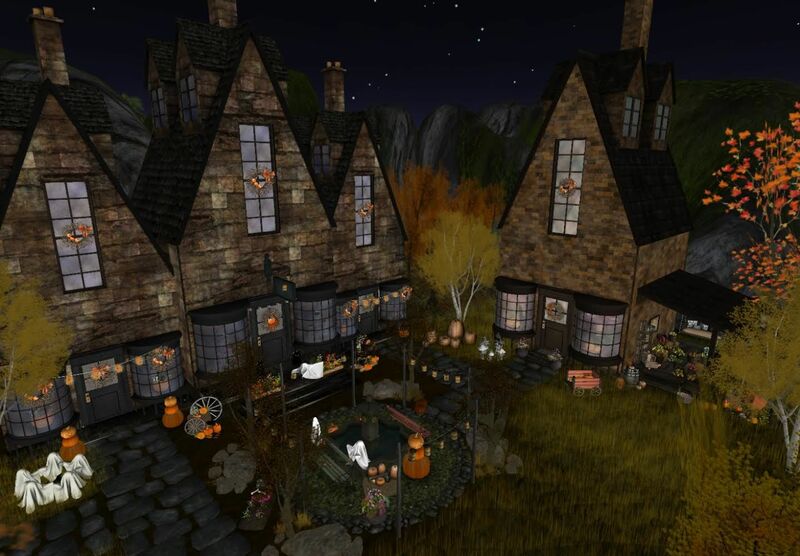 I really enjoyed creating the Ravenshire Halloween Village not only because I love the spooky holiday, but also it allowed me to showcase all my sponsors with six individually designed rooms and created the village courtyard with landscaping. The Wolf Lair was one of my first adventures into interior design and it still stays with me today as a favorite. I love its’ dark haunting feel using an unconventional structure of the snow-covered gazebo as the wolf’s cave. In 2015, I would love to explore the creepy gothic mood created in the post. Honorable Mention: Where Dreams are Made! Another great example of transforming an unconventional structure into a usable spot was the kids playhouse utilizing a garden shed. Loved how the playhouse had a whimsical playful feel perfect for hosting tea with your teddy bears. 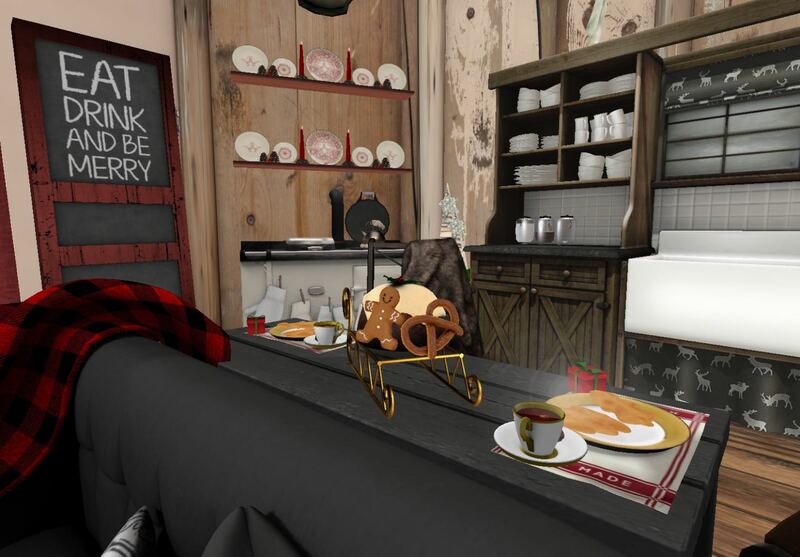 My first love is art and when I had the opportunity to blog for the FashionArt Fair I was able to share with you some of my favorite artists, providing a brief history and the SL fashion designer inspirations. There were some great posts to choose from, but everything came together perfectly in the homage to Piet Mondrian. The reason I selected the Quiet Reflections blog was because I shared with you a little more about my background. For the last two years, I’ve been struggling to break down some of my walls while still engaging the audience, and I think in 2014 I had a break through by adding personal stories. More to come. I’ve had a few nicknames in SL, the ‘shabby chic queen’ and ‘bedroom eyes,’ and looking back I know how I got them. 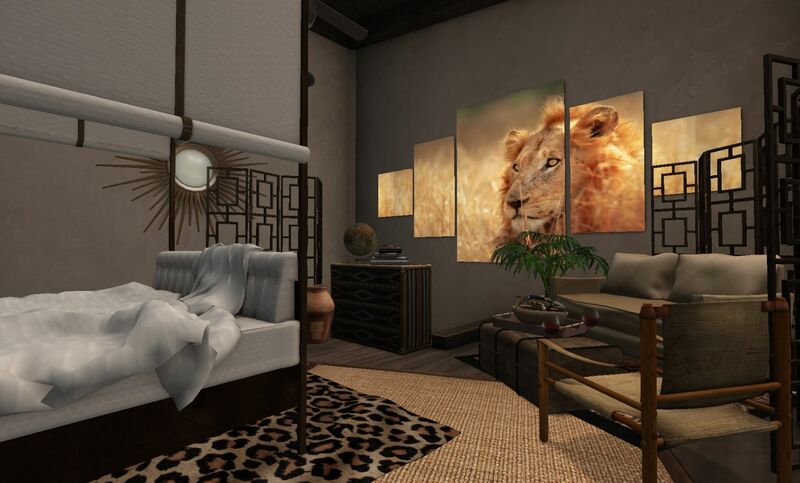 I’ve designed a number of bedrooms and my all time favorite is the African Queen. I love the mood of the room, it transports me to the dark continent without any jet lag. 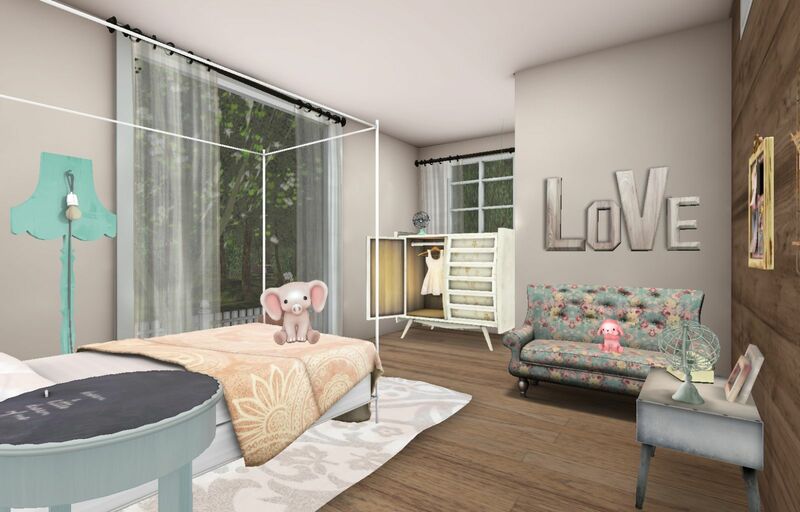 Just between you and me, I designed this bedroom with my design partner and best friend Niki in mind. She’s the animal print girl of the group and has taught me everything I know about interior design. Hope you loved it Niki as much as I loved styling it! I’m really proud of the houseboat build, its uniquely coastal living and another chance to highlight my point of view. 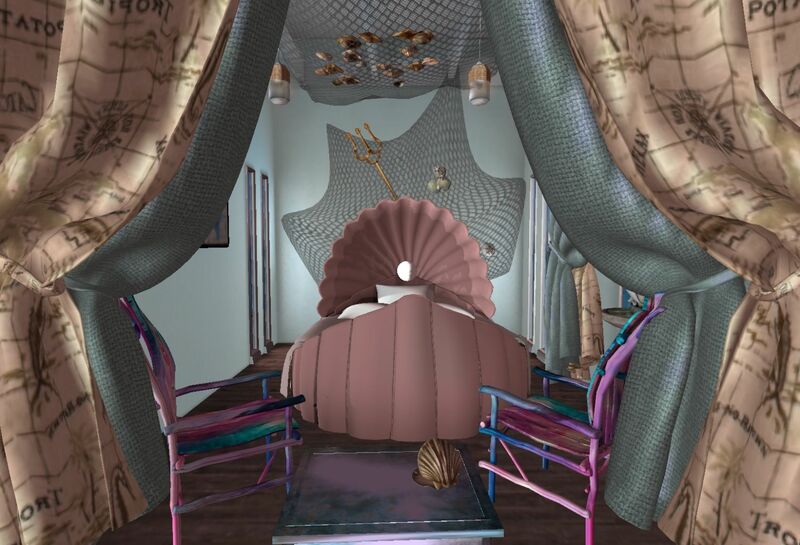 To create a private bedroom haven in the large open houseboat, I divided the space with double drapes and hung fish netting from the walls and ceiling creating the under the sea vibe. I think it turned out great! They say in life it’s all about timing and it couldn’t be more true. 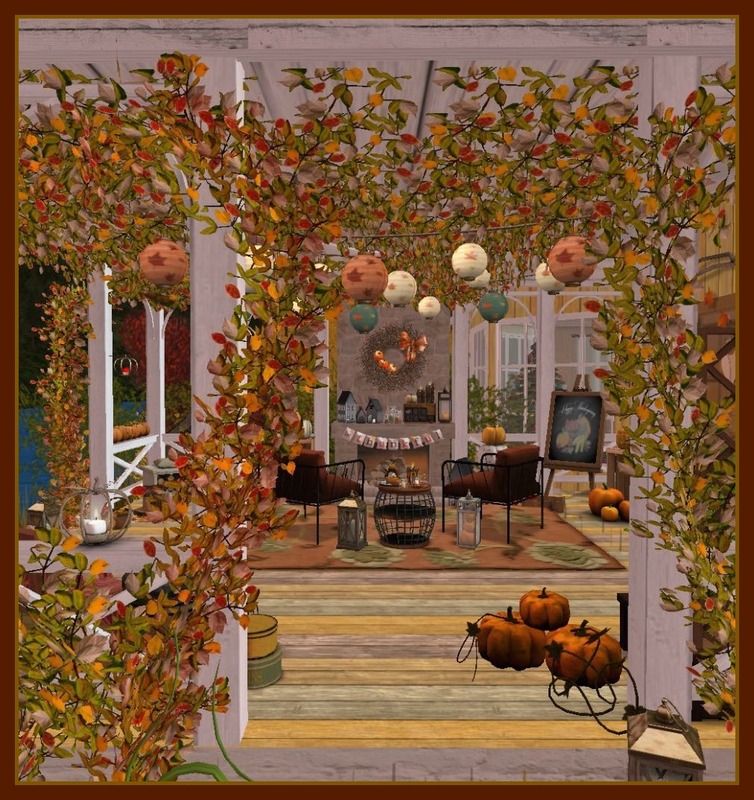 I selected the Bask in the Glow of Autumn post because it was the first blog I published after I returned to SL. As most of my loyal readers know, I needed a break after some horrible people I encountered made me creatively and mentally drained. It seemed appropriate that the blog was honoring the upcoming Thanksgiving holiday because I can count myself lucky for three ladies, Niki, Ayla & Morgan, who helped me through a dark time. I also love the calm and peaceful mood created on the veranda and the layers of multiple resting areas. Well, as you know by now I’m a bit fearless when it comes to styles. I’m always willing to try something once and wholeheartedly believe that the only way to grow as an artist is to challenge yourself, that’s why I created the monthly ? 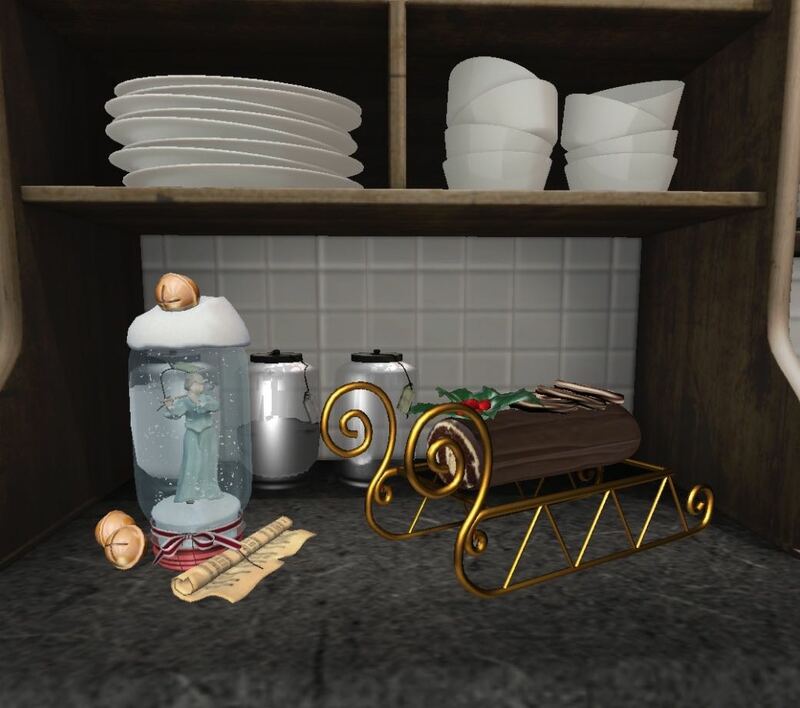 room feature. I have observed that some interior stylists have a niche, stay in their box and never evolve; the one thing I don’t want anyone to say about me is she’s not original. 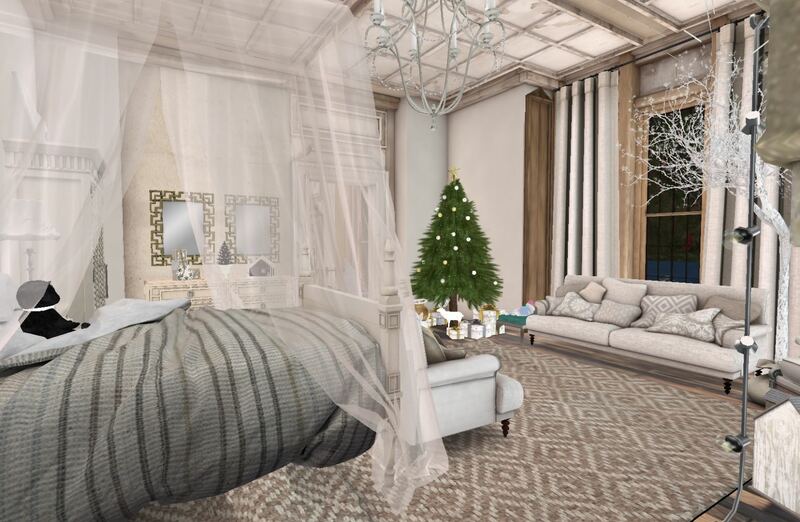 I had the opportunity to explore 17th century French mansion living with Spargel & Shines Homes Maison d’Ete build. I’ll let you in on a little secret, I designed, landscaped and photographed the build at a sandbox in six hours. 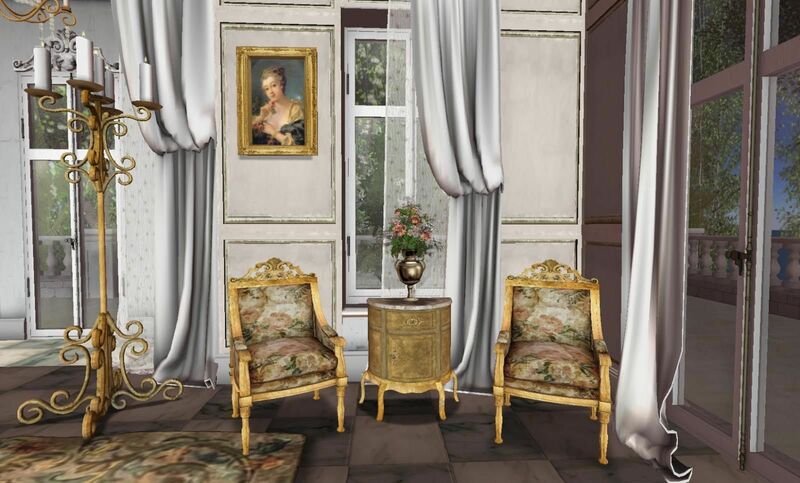 I ran out of prims on our parcels and was literally under a deadline, so if for no other reason A Stately Manor post deserves an honorable mention, but also because I challenged myself to tackle the 17th century and I did! 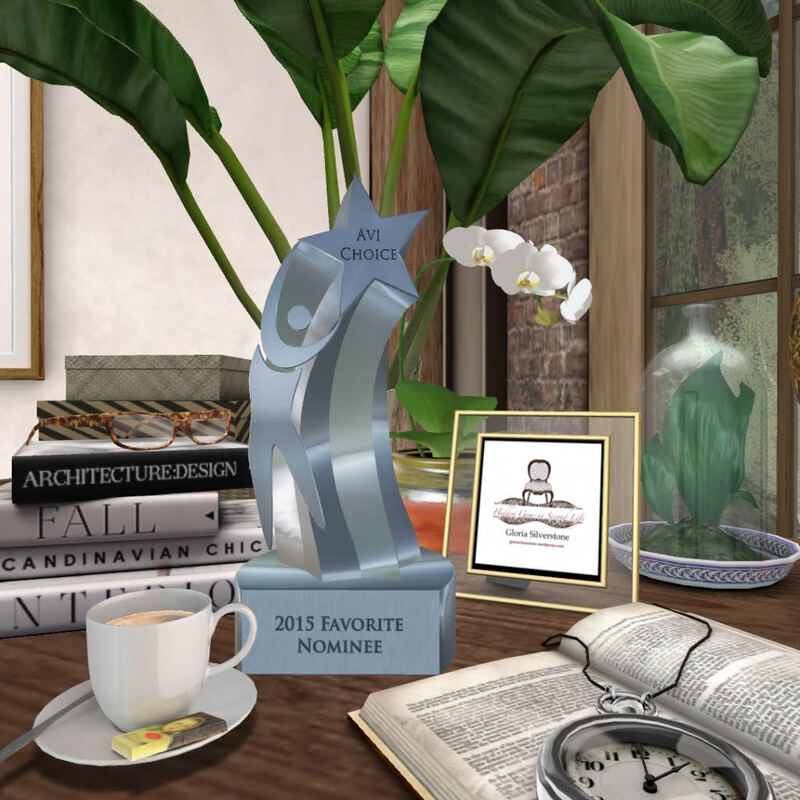 Hope you enjoyed the top 10 list and let me know what interior style you want to see in 2015. I have a few ideas about a new feature brewing. Wishing & hoping that all your dreams come true in the New Year! Happy Holidays! I hope you had a wonderful celebration and were surrounded by love, laughter, family and friends. 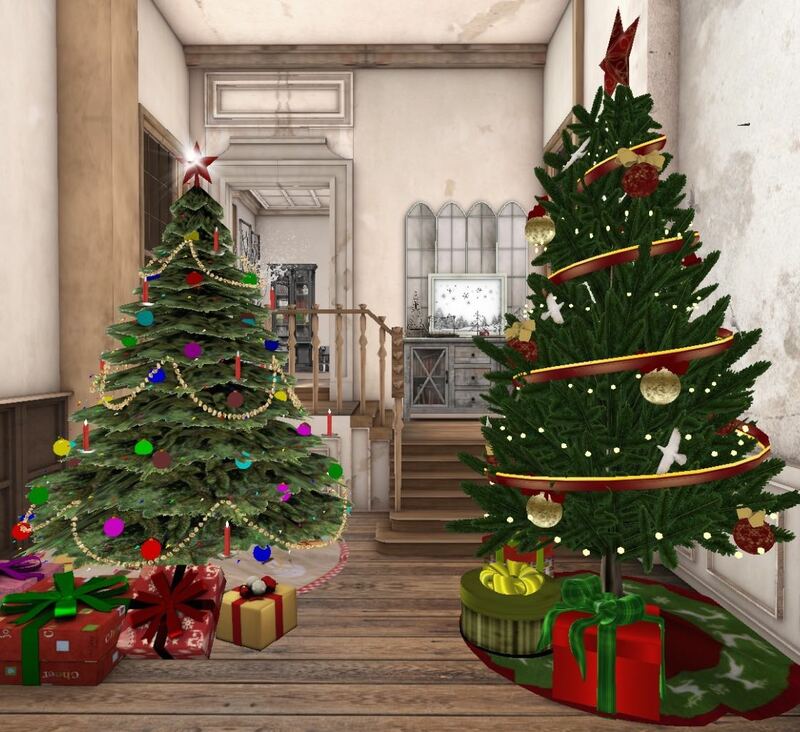 We, at Hidden Gems in Second Life, wish you a wonderful New Year! 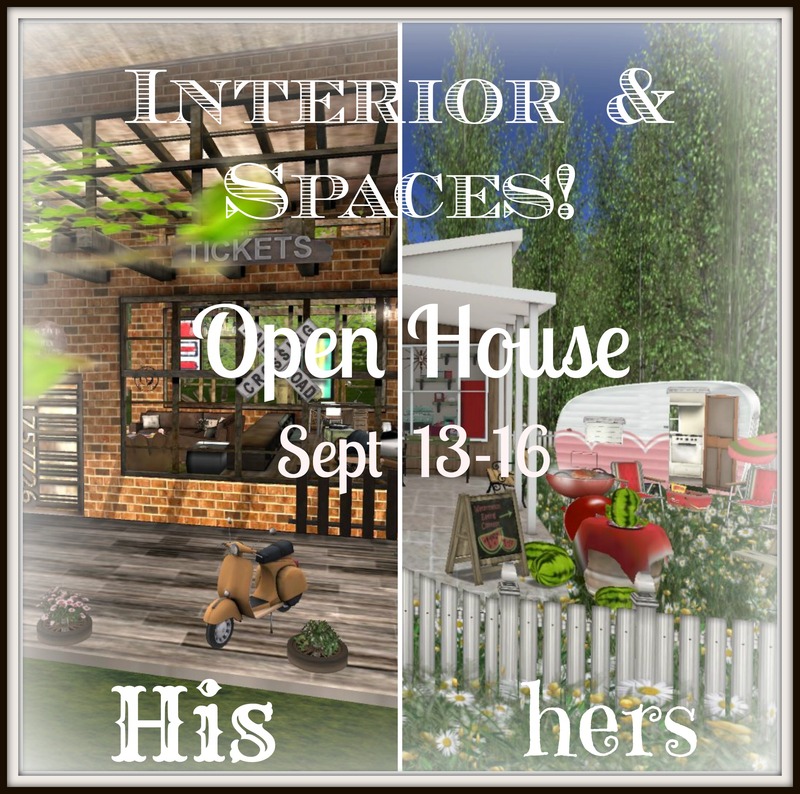 My design partner, Niki Silverweb and I are opening the doors to our personal homes for the last Interior & Spaces Open House of 2014 from December 30, 2014 to January 6, 2015 (SLT midnight). 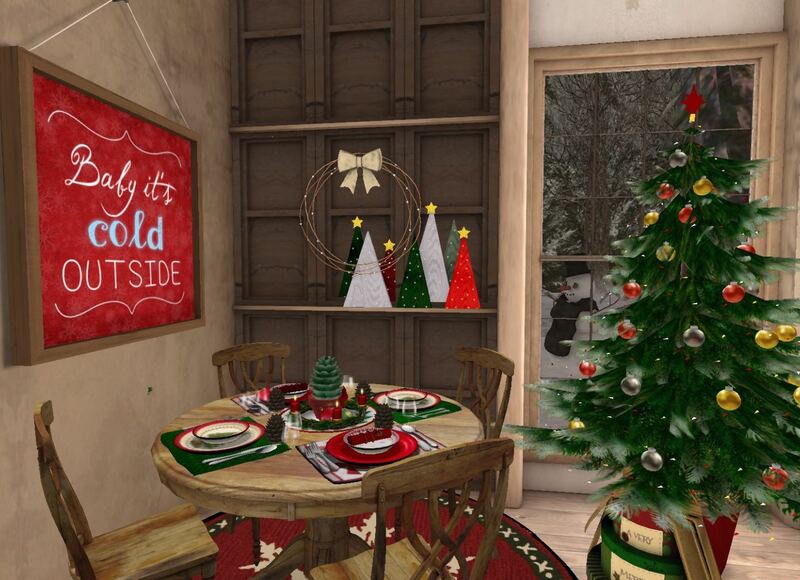 We created two charming holiday homes that showcase some of the fabulous Christmas tree designs and holiday decor offered on Second Life. We were a little late this year because we both ended up with the flu, but we wanted to take this opportunity to invite you on a self-guided tour to enjoy our take on this festive season. 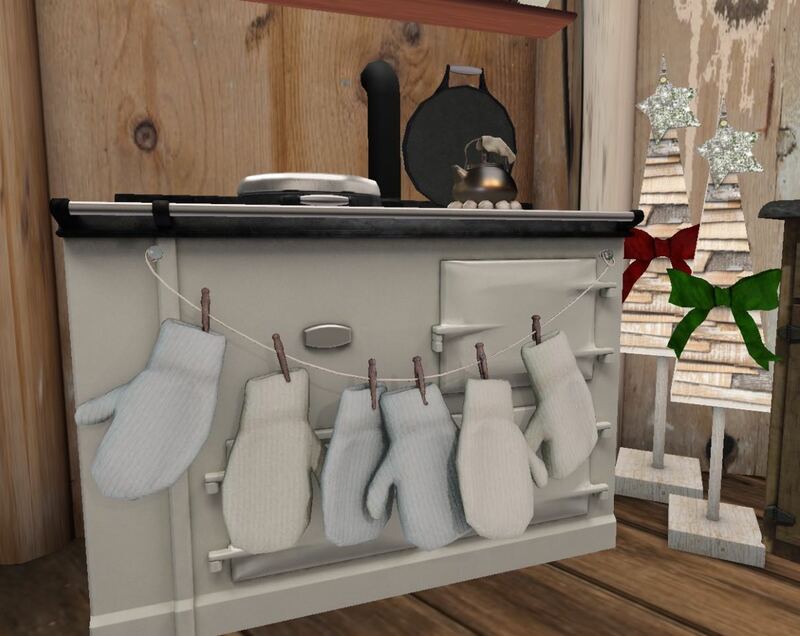 It’s never too early to plan for holiday 2015! 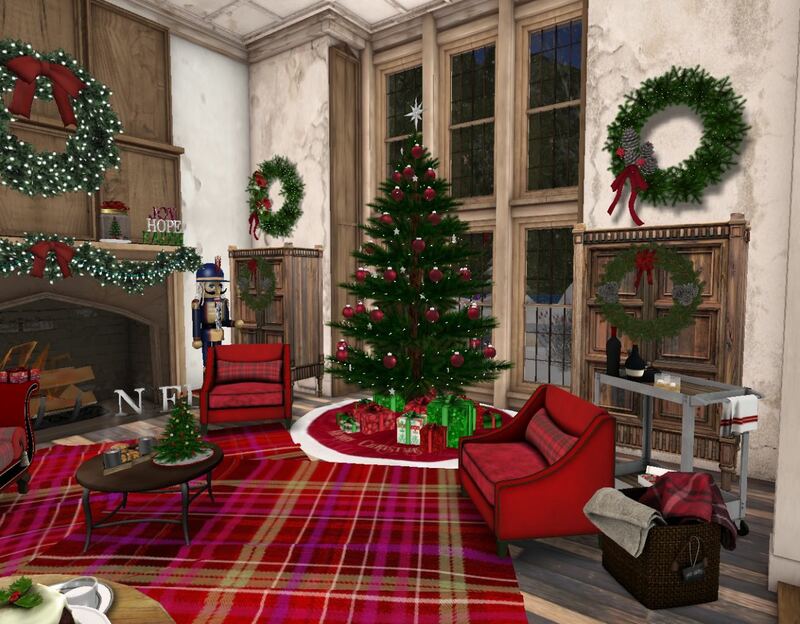 Our main home is the Scarlet Creative Lavender Brown house which features a master bedroom suite, dazzling entry hall reception area with mobile snowflakes hanging from the ceiling, a hall of trees inspired by real life traditions, a tartan plaid formal living room, and a fun-filled family dining room with kid’s table. 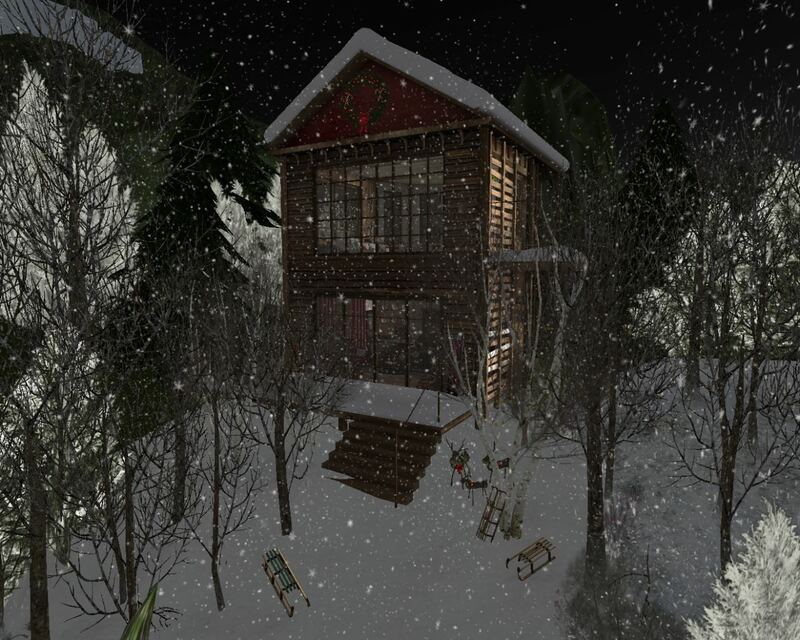 Nestled in the hillside forest is our guest quarters also designed by Scarlet Creative. The Princess Jezibell Snug is a two-story cabin with a rustic eclectic vibe complete with a downstairs great room and an upstairs bedroom retreat with sleeping area for four or more. 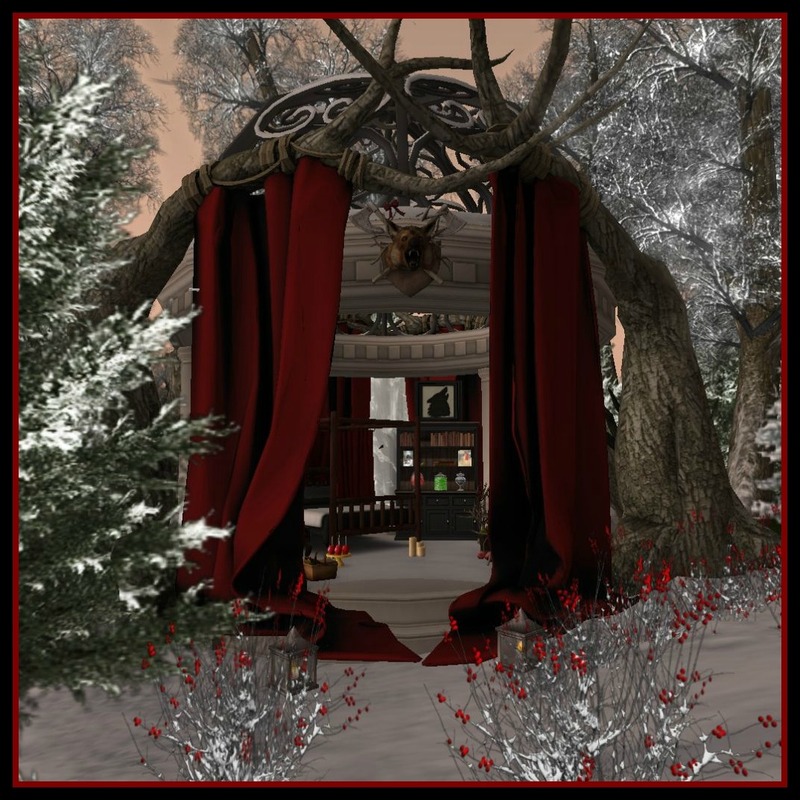 We brought the holiday entertainment outside with hillside sledding, skating, hiking and a quiet spot among the hanging lanterns in the Barnesworth Anubis Filigree gazebo. 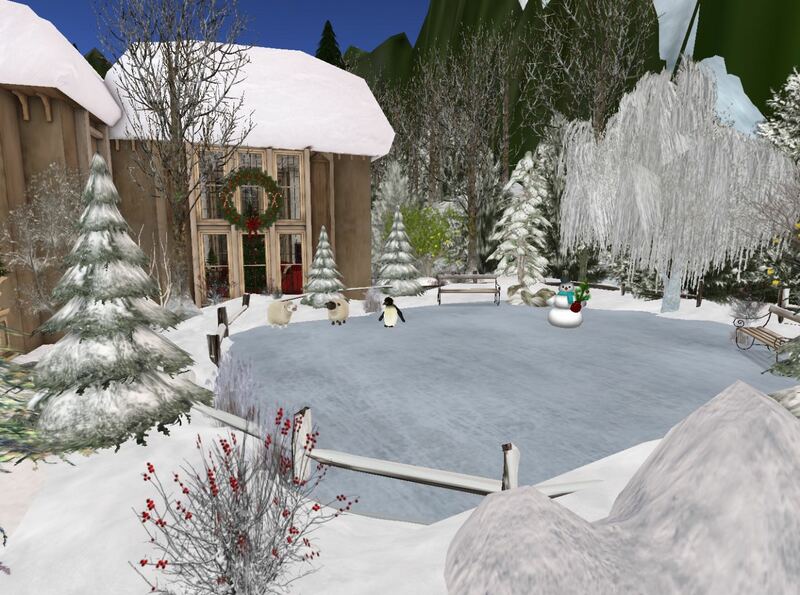 While exploring the great outdoors, you will encounter sheep, rabbits, deer, weasels, and penguins dotting the property. We hope you enjoy the open houses and are inspired by our vision! First thank you all for your support and great positive feedback with last weeks open house. When my design partner in crime, Niki Silverweb first suggested the idea I was scared that we would be spammed, or no one would show up. I couldn’t have been more surprised by the great outpouring from friends, designers, and fellow bloggers. So, since it was a huge success last weekend, we are going to open up our homes this weekend, Sept 13-16. It’s the perfect opportunity to showcase both of our styles. 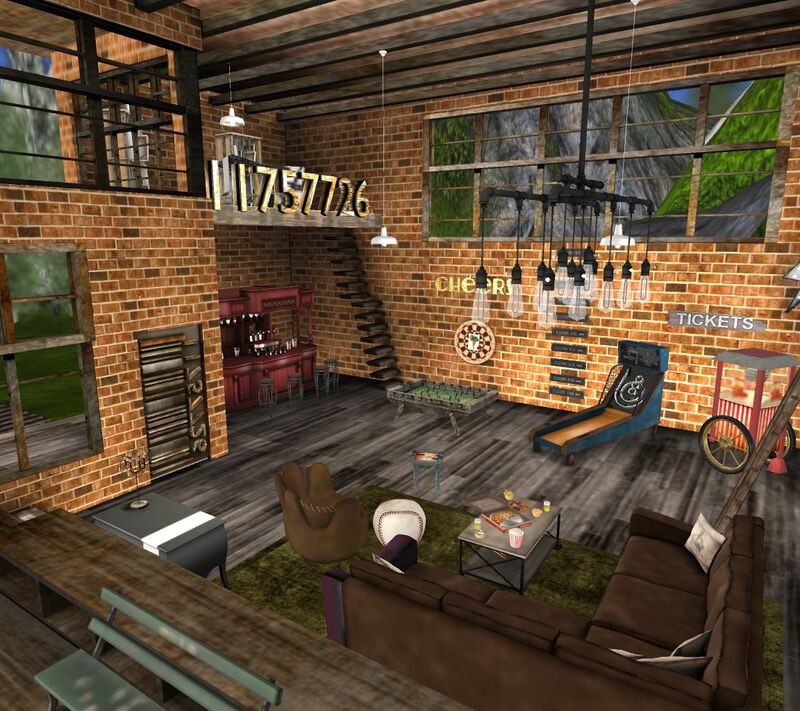 Early in 2014, Niki & I collaborated on our first build together, the Men’s Warehouse, an industrial loft space with game area, bar, Niki’s art studio, and rest/work zone with walls of bricks and open windows. 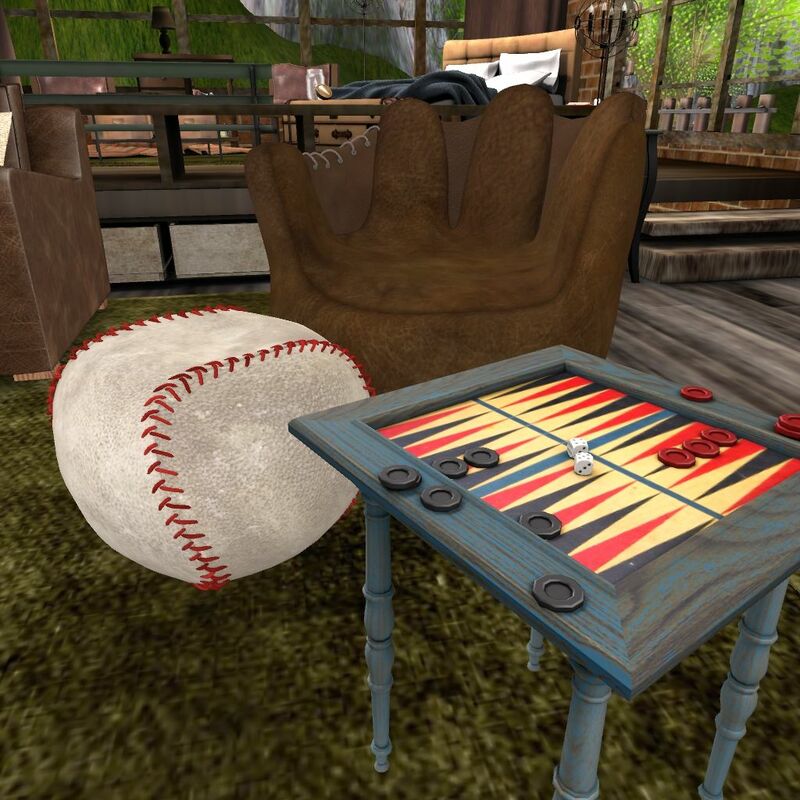 It is the best guy’s hangout I’ve seen on Second Life. It’s truly awesome! 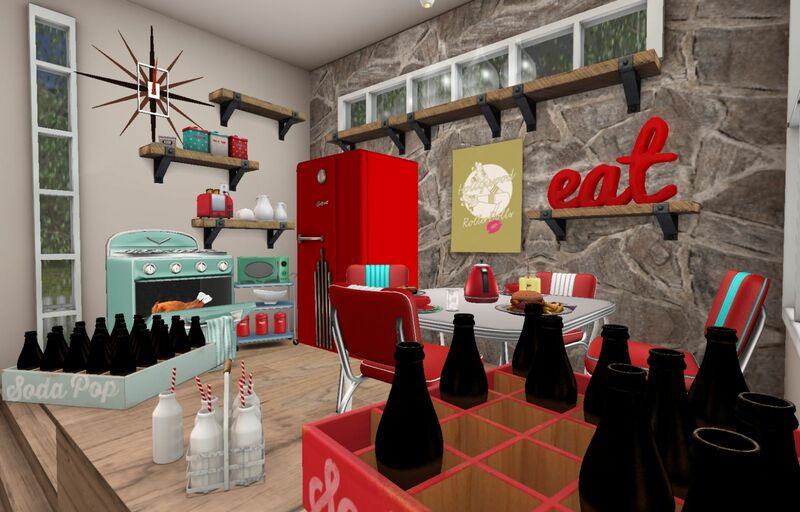 A few months ago, I gave you a sneak peek of the bedroom in my retro Palm Springs home. 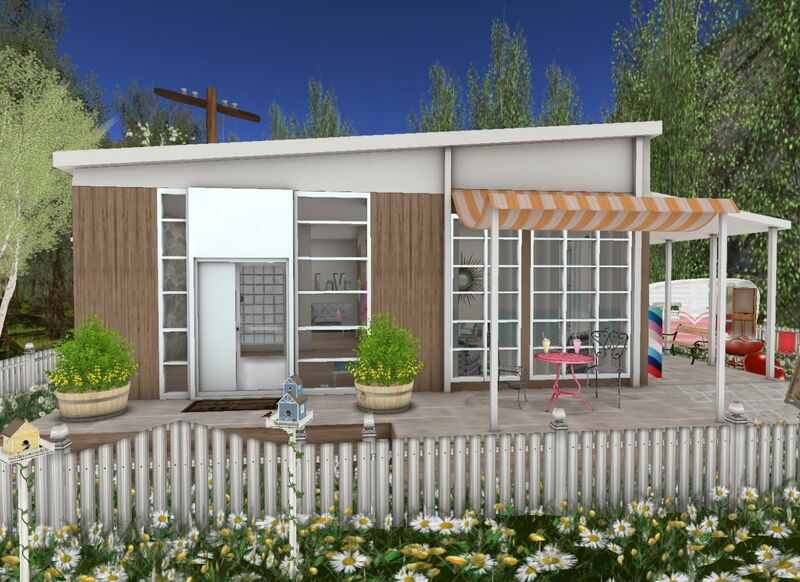 Today, we are going back to the 50’s inspired mid-century modern home with walls of glass, wood paneling, and a very cool side yard. 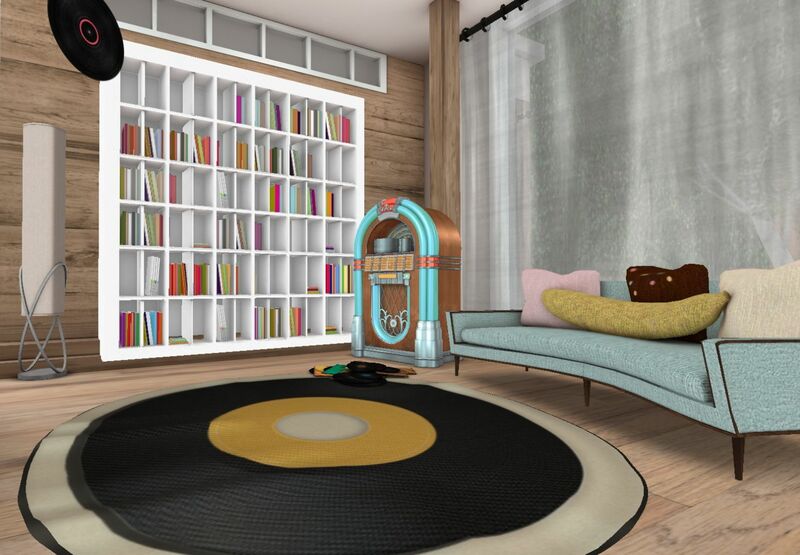 The home features a stone facade entry with modern art installation (& Snowflake, our DIVA cat’s digs), a large wood-paneled living room decorated in black, white, and yellow with starburst mirror over the see-through fireplace, a music room complete with jukebox and scattered records, and a 50’s kitchen in red, white, and teal, finished with retro appliances, decorative signage, and of course a turkey in the oven! I tried to stay true to the mid-century movement with sleek lines, bright colors, hard edges, and an overall uncluttered look. The outside yard plays host to family/friends BBQ with watermelon influenced patio furniture: aluminum lawn chairs, picnic set, drink dispenser, and a pink/white camper! Wander out back and meet our Sassy and her gang of sheep, relax, stay for dinner, and enjoy (grab a beer at Niki’s)! Bridging our two distinct builds in an enchanting magical forest. Stop by and check it out this weekend. Be on the look out for more open houses to come!